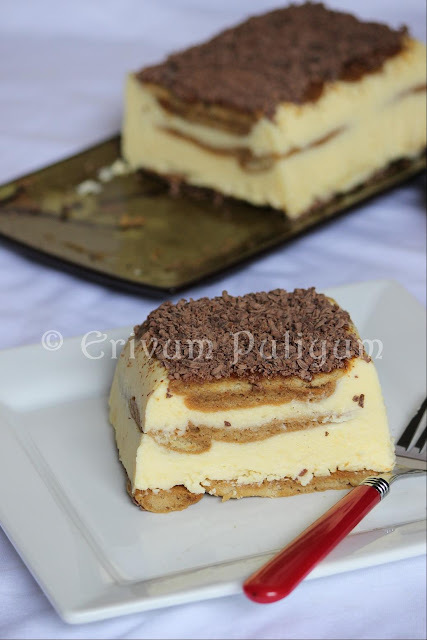 And finally here comes the much awaited post by everyone visiting my space and a long awaited wish come true to make my own tiramisu at home with the homemade mascarpone cheese,lady finger cookies, vanilla custard.Am very happy to share this with you all,friends ! !Tiramisu is an Italian dessert invented in a restaurant in Italy which means "pick me up " or "carry me up" which refers to the jolt you get after eating the dessert.This dessert uses an English style custard but I have modified to a basic vanilla custard as otherwise the dessert is very rich so just wished to avoid eggs.I have omitted the alochol too.This is a dessert made in heaven,love each bite of the dessert.The recipe is adapted from one of my favorite sites here.Hope you enjoy too the same way !! FOR MAKING CUSTARD- Heat about 1 3/4 cup milk in a sauce pan.Dissolve the custard powder in 1/4 cup cold milk(remaining) without lumps.Bring the milk to a boil,add the custard mix and keep whisking on medium flame without burning the bottom until the custard is medium thick.Immediately transfer the custard to another bowl and cover the surface with a cling wrap so that it doesn't form a film.Refrigerate until thick and cold. FOR CREAM FILLING-Bring the mascarpone cheese to room temperature and whisk with a wooden spoon until smooth & soft.Add in the cold custard and fold in with the mascarpone cheese until smooth. FOR COFFEE SYRUP- Mix the strong brewed coffee with sugar.Add more or less sugar as desired. FINAL ASSEMBLING- Line a loaf tin (9*5*3) with a cling wrap.Make sure the plastic wrap extends to the sides of the pan. (makes easier to demould).Keep the lady fingers ready,dip each lady fingers in the coffee syrup and line them as a single layer in the bottom of the pan.Spoon half of the cream filling on top.Repeat the same steps with the next set of lady fingers and then top with cream filling.Repeat for 3 layers,ending with lady fingers.Cover with a cling wrap and refrigerate for 6 hours. SERVE- Remove the cling wrap on top and invert on a cake stand or a tray by holding the sides of the bottom cling wrap and remove the cling wrap gently.Dust the top with cocoa and shaved chocolates.Ready to serve & enjoy !! * You can make the regular english custard instead of this basic custard but this tasted great too. * Though I mentioned in my previous post that lady fingers had an odor of egg but that vanished after soaking in coffee syrup and final serving.Also,the lady fingers were so spongy that i just had to dip it once and they were soaked up. 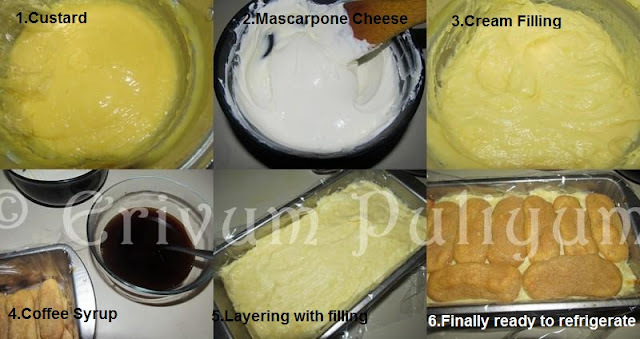 * You can use sponge cake recipe too instead of the regular lady finger biscuits,tastes almost same. * You can use store brought mascarpone cheese too. * You can add rum to the coffee syrup to enhance flavors. I saw your link in my blog post saying Mexican dish event,but unable to locate page.. Happy to link some recipes. not fair, you teased us since so long and now you have posted my most favorite pickme up. absolutely yummy cake. you made it well dear.. nice clicks.. Wow! !looks so so tempting and perfectly made,nice presentation and feel like grabbing it.. Finally, the much expected tiramisu is here... Its my favorite dessert, Julie.. You have prepared it perfectly.. So yummy.. I was waiting for this one.. looks absolutely delicious! Awesome...i can have Tiramisu anytime...its my favorite dessert! 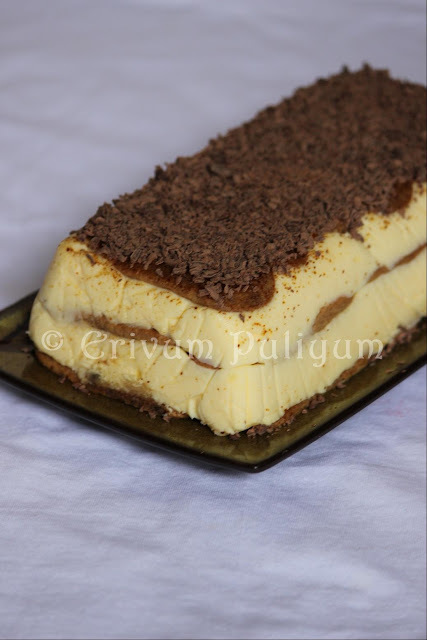 I've never made tiramisu with custard, it must be delicious. Yummy! I've emailed you because you've written in my site something related to a mexican site and I don't undestand what you meen saying that. wow its an adiicition.. bookmarked.. once i buyt mascarpone chesse this is def in my do list..
delicious taste and beautiful name. except i dont use rum.. substitute with something else.. ya, i dont drink liquor. YOU MADE IT DEAR !!! Julie , this is one of my favorites ..... I esp.go to a restaurant to have this ... But now you shared your recipe, I will try this at home . no more pieces. pack up the whole thing and mail it to me. Wow tiramisu looks creamy and delicious.Need to try once. Looks absolutely delicious - and love the fact that you made the mascarpone cheese and lady finger at home..wow!! Looks so good Julie- I love tiramisu :) Beautiful pictures, once again! absolutely stunning... i can't take my eyes of it and it definitely looks really delicious... love your page!!! My all time fav dessert Julie..you have made it perfect..What more to ask..just indulge. Your tiramisu has turned out perfectly. All your hard work paid off well. 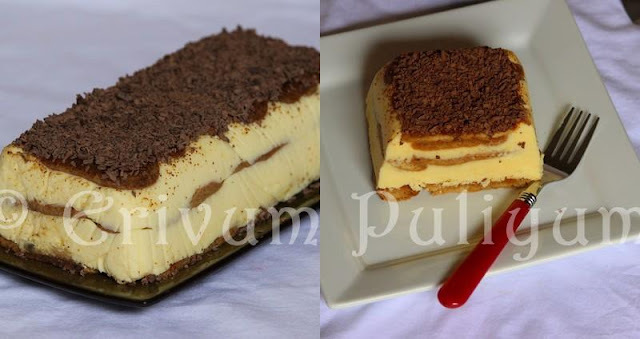 I just luv Tiramisu, that look so tempting. OMG! My fav too. 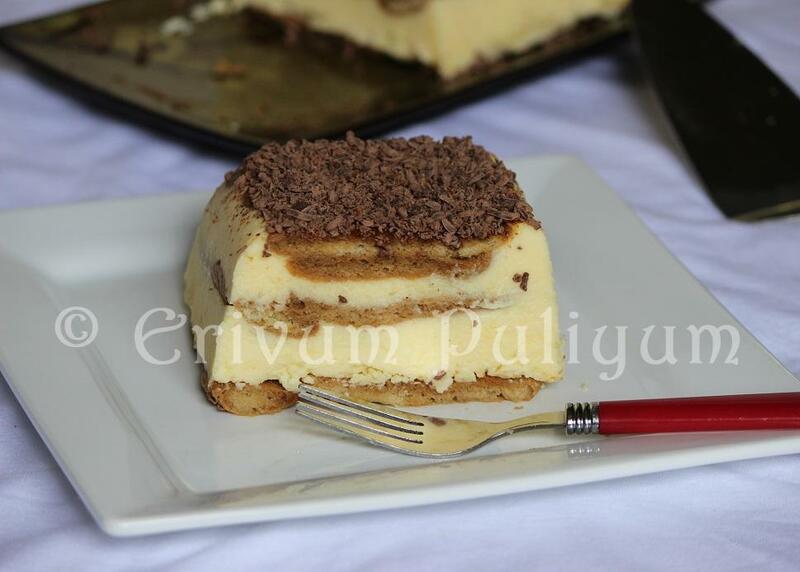 Perfectly made dear, looks yummy and delicious tiramisu. Bookmarked it. Kudos to your efforts Julie.. Making tiramusu at home from scrach is difficult but you made it perfectly. Now, Can you pass some for us? Tempting much.. Superb Julie, lots of effort hah.. doing it from scratch..
Wow! Everything from scratch, and you make it look simple and beautiful. Great work, Julie! Great attempt in making Tiramisu from the scratch! This one looks absolutely YUMMY & gorgeous too!! Hi Julie..nice tutorial, bookmarked it, will try soon, thanks for sending it to spotlight: valentine's treat..can you please send me a pic to my email, riappyayan@gmail.com...as I'm doing the round-up now and your page is right-click protected.